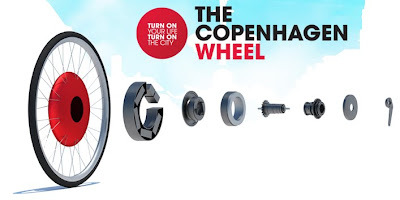 One of the prime points behind the marketing of Copenhagen Wheel was its regenerative braking capability. Back in January, being the curious cat that I was, I wondered whether the design would be practical for Copenhagen where the outlook for 2012 is in establishing biking superhighways and such. The question posed by me was how many stops it would take a cyclist to recover at least 10% of the total battery capacity in the wheel. My argument was that if it was a good amount, then it may make sense in crowded city riding conditions. With biking superhighways, number of stops may decrease so would regenerative braking be a much sought after feature then? Recently, Christine Outram of MIT's Senseable Lab wrote to me clarifying the working of their design. From her, I learned that the wheel they showed at the Climate Conference was actually prototype number 2, with an off-the-shelf motor selected due to their time constraints. After the Conference, the team began their prototype 3 design phase to custom design the hub motor in order to make it smaller, lighter and more efficient. Through custom building of parts, she claimed that the hub would end up at about 2/3rds of the current size and weighing 3.5 kg. I also picked up on some other important things from her email. For those who want to know how the wheel really works during pedaling, read on. 1) Using the bicycle : When cycling, the rider can choose one of three motor assist modes : low, medium and high. Each mode represents how much the motor is supplementing the cyclist’s cycling input (eg: effort x1, x2, x3) as calculated through our torque sensor. There exists a sleeve-style mechanical torque sensor to measure the amount of effort the rider exerts as well as the speed and direction that of applied pressure. The readings from the torque sensor direct the motor on how much to supplement the rider, based on the motor assist mode the rider has chosen. Similarly, when the rider wants a workout or to recharge the batteries, they may choose a low, medium or high ‘exercise’ mode. Here, the rider is working against motor eg: effort x (-1), effort x (-2), effort x (-3). 2) Battery life in motor assist mode : Christine provided me some sample calculations to calculate the battery life. Typically, a flat city commute of 2 km will make a 70 kg cyclist expend 31 Watts of power. This distance can be covered in 8 minutes. So if the motor assist is set to times two, the same commute mentioned above can be done in 4 minutes. In this case, the battery can be expected to last 8 hours on a single charge. The same commute but with a 0.01 grade slope (gentle up-slope, 1 in 100), which is common in cities, requires 70Watts of power. This is a more likely scenario to use the motor assist mode. If set to times two, the batteries will last just over 3 hours and 50 minutes. If the motor assist is set to times two, a rider can climb a 0.05 grade slope such as in a hilly city, like San Francisco, with the same level of effort and at the same speed as he or she would typically apply on a gentler 0.01 slope. 3) Battery charging in exercise mode : Let's consider the same commute distance. If the exercise mode is set to times two (the same commute will require twice the effort), the rider must provide 140Watts, and can burn 6.7 kJ (16 food calories) in his or her 8-minute commute. Additionally, if on exercise mode times two, discharged batteries will be fully charged in 5 hours and 30 minutes. Note that the above points talk about the charging and discharging of the battery in pedaling mode, and not regeneration through braking. I hope we can get further clarification about that aspect from the team. "1. Providing ease of usability. Most other e-bikes on the market have bulky battery packs, are hard wired and are not able to be retrofitted in an existing bike. 2. Creating an elegant design where all components can be packed into one hub. 3. Augmenting the bicycle with small amounts of technology to encourage people to cycle - hence the social and data networking aspect. It may not be a motivator for everyone, but the electronics will continue to get cheaper, and if it convinces some people to ride a bike, then this is great. 4. Pushing the research agenda of the lab, which includes understanding how distributed sensing in cities can help us understand a city's infrastructure, how it can influence and promote sustainable behavior and how we can contribute to the design and development of sustainable places. This research agenda is also about imagining a future, 10-15 years from now, when these technologies will be much improved and fully integrated into our lives. Through this vision, we attempt to create leapfrog urban demos. in the present day. Hence, the construction and demonstration of the Copenhagen Wheel, which was made possible through bringing together from a variety of backgrounds including architecture, urban planning, computer science, network analysis, interaction designers, sociologists and mechanical and electric engineers."